Fitting a heated towel rail will add style and functionality to your bathroom. There are a variety of designs, styles and finishes available on the market to suit your personal preference. If you possess electrical wiring and plumbing skills, you will probably fit a heated towel rail a welcome challenge. Towel radiators which will connect to the central heating loop. Isolate the radiator by shutting off the isolation valves. Remove the radiator from the wall. The job is plug-and-play in nature, and there is no need to drain the system or take up flooring or mess with the skirting boards. So, if you’d rather have a plumber come and do this job for you, how much will it cost? Prices will vary considerably across different parts of the UK, as well as depending on the style and size of towel rail you choose. One thing to watch out for is fitting a towel radiator with lower heat output than the radiator you are removing. The reduced heat output may lead to increased moisture in the bathroom. The towel radiator will only need the services of a plumber, which reduces your costs slightly. 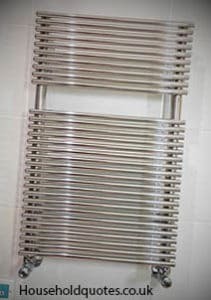 For a simple towel radiator installation job, whether connecting to the radiator or hot water circuit, you can expect to pay around £350 to £450. The cost covers a basic towel rail plus materials and labour. If you are supplying the towel radiator, then the price will be a little lower. Electric towel rails come under the remit of the Electrical Wiring Regulations and bathrooms are designated as “special locations” for electrical installation. Building Control notification will be needed under what is known as Part P Regulations, and so you will require an electrician to carry out the electrical wiring for the towel rail for you. Installing an electric towel rail a simple job for most electricians and should take them just a day. Costs will vary depending on cable runs, and accessibility, so be sure to have the electricians quoting against the same specification. Labour at the day rate of £200. Standard electric towel rail at £160. Materials including a timer at £60. The electrician will also fill out the necessary paperwork for Building Control, as well as issuing a test certificate for any new electrical circuits they install. You can reduce the cost of this project by purchasing your towel rail and supplying that to the electricians to fit. It may also be possible for you to carry out the electrical installation if you are competent, and then have an electrician certify and perform the notification on your behalf. Why choose one over the other when you can have one towel rail that is connected to your hot water circuit as well to the electrics. A dual fuel towel rail offers the advantage offers the advantage that you can turn the central heating in summer and still enjoy warm towels after a bath. The price for this type of installation is higher than the two previous jobs because you will require the services of both an electrician and a plumber. If you are great at plumbing, you can perform the wet installation so you can reduce the cost of the job. An electrician will then come in to complete the electrical installation. For this job, the total cost should be between £500 and £700. This cost includes labour for an electrician, a plumber, materials and the dual fuel towel rail. Now you know the cost of heated towel rails, it may be time to find a tradesmen to do the job for you. We suggest using Quotatis. You simply fill out their short form with details of your job and they will find qualified tradesmen in your area.